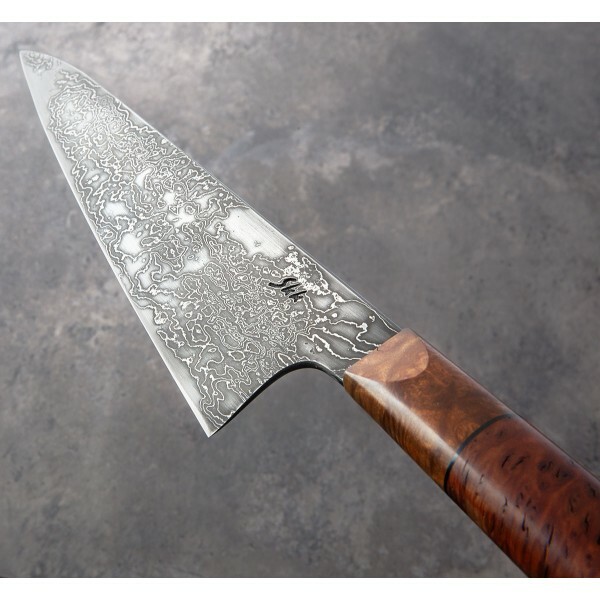 Fast and light with a 220mm san mai blade, this gorgeous chef knife is handmade by Saul Kokkinos-Kennedy in Melbourne, Australia. 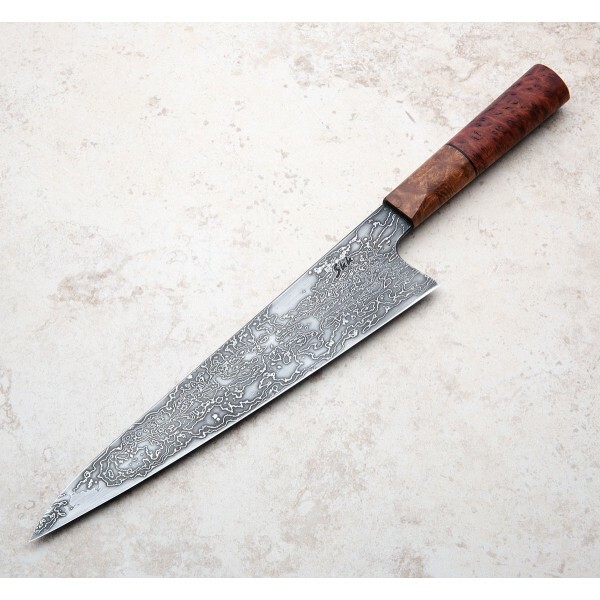 The thin yet stiff, fully hardened blade rocks slightly on a board and fills the hand for all-around prep work in any kitchen at an excellent size. 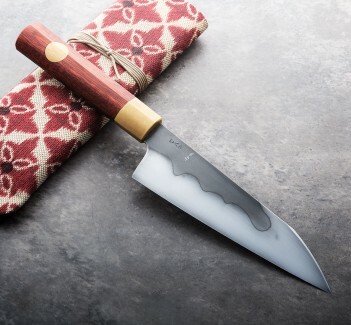 House-made with random pattern 1084 & 15n20 damascus over a Blue No.2 core, the blade tapers to a thin, aggressive tip and features a convex grind, with a balance point directly at the heel. Carved from red mallee burl with a brown coolabah bolster and black G10 spacer, the handle is exceedingly comfortable in the hand in any grip. 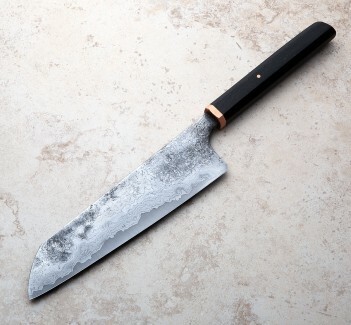 Starting with this superb knife we're honored to welcome Saul to the Eatingtools collection. A maker based in Melbourne, Australia, Saul Kokkinos-Kennedy of SKK Knives developed an interest in metalwork at a young age as the son of a goldsmith, working in a number of disciplines involving metal and blacksmithing over the years before embarking on a mission to craft heirloom-quality chef knives for professional and home cooks. The "combination of functionality, artistic design and science, plus a love of cooking and using sharp knives" is where Saul's culinary tool inspiration comes from. We'd say he has found his niche. 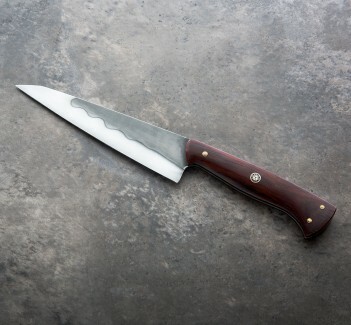 Blade length: 220mm / 8.66". Overall length: 350mm / 13.75" overall. Blade width at maker's mark: 2.3mm. Blade width at midpoint: 1.5mm. Blade width 10mm from tip: 0.5mm. Blade height at heel: 51mm. Weight: 4.55oz / 129g. 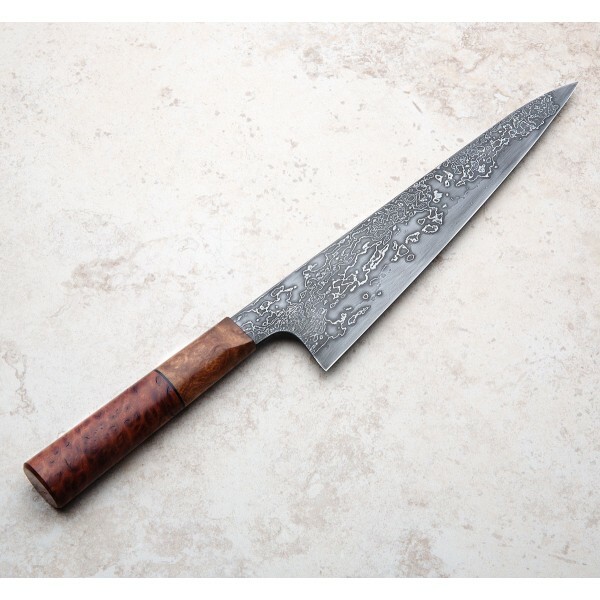 Blade: san mai steel with 1084 & 15n20 random pattern damascus cladding and Blue No.2 core. Handle: Red mallee burl with brown coolabah bolster and black G10 spacer.